(From L to R): Stephen Matonti, board member, Huntington Breast Cancer Action Coalition, Melanie Harris, Director of Communications, Huntington Breast Cancer Action Coalition, Art Donnelly, volunteer, Huntington Breast Cancer Action Coalition, Karen Miller, board member, Huntington Breast Cancer Action Coalition, Greg George, VP of Operations for Doherty Enterprises, Jill Stone, director of development information, CSHL, Charlie Prizzi, VP for development, CSHL. 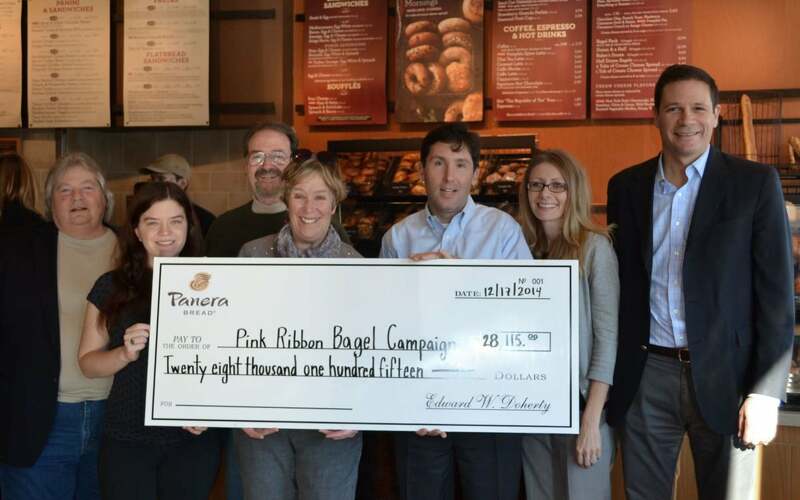 Cold Spring Harbor, NY — The Breast Cancer Research Program at Cold Spring Harbor Laboratory, where innovative breast cancer research is being performed, was among the beneficiaries of this year’s annual Pink Ribbon Bagel campaign run by Panera Bread. The campaign raised more than $28,000 to benefit local breast cancer organizations during Breast Cancer Awareness Month. Greg George, Vice President of Operations of Panera Bread, presented a check for $28,115 to members of Huntington Breast Cancer Action Coalition (HBCAC) and Cold Spring Harbor Laboratory, local breast cancer organizations, on December 17. The money was raised during October’s Breast Cancer Awareness Month, where a portion of the proceeds sold from its Pink Ribbon Bagels, shaped in the form of the iconic pink ribbon, went towards support of research, education and efforts to raise awareness for the cause. Gilda’s Club New York City and Adelphi NY Statewide Breast Cancer Hotline and Support Program were also recipients of funds raised at 36 participating locations in Brooklyn, Long Island, Queens and Staten Island owned and operated by Doherty Enterprises. In total, 44,790 bagels were sold, providing Long Island charities with a donation of $25,335 and $2,780 to Gilda’s Club New York City.